Pop is ready to commit! The network just announced they’ve renewed the TV show Hot Date for a second season. Based on the CollegeHumor web series, the comedy explores the awkwardness and hilarity of dating in the 21st century. The cast includes Brian K. Murphy and Emily Axford. PASADENA, CA – January 30, 2019 – Get those one-liners ready, Pop is renewing HOT DATE, the original sketch comedy series from Electus’ Big Breakfast and Executive Producer Will Arnett’s Electric Avenue Productions, inspired by the wildly popular CollegeHumor digital series. The 10-episode second season was announced earlier today by Pop President Brad Schwartz at the Television Critics Association tour. Additionally, Schwartz announced Pop’s order of two new scripted comedy pilots: BEST INTENTIONS from A+E Studios with Writer/Executive Producer Adam Herz and Executive Producer Ben Silverman of Propagate Content; and RIDE OR DIE from writer Matt McConkey and Ellen Goldsmith-Vein and Stacey Lubliner of The Gotham Group, as well as Nomadic Pictures, with Executive Producer Michael Rosenberg. HOT DATE (SEASON TWO): Fronted once again by husband and wife comedy duo Emily Axford and Brian K. Murphy, known for their hilarious parody content on CollegeHumor, this season of HOT DATE will tackle the awkwardness and unpredictability of friendships, love and adulthood with the help of new characters and familiar faces from the show’s freshman season. Season two will be set in a new city, New Orleans, and focus on the many eccentricities “The Big Easy” has to offer – from gluttonous bourbon-induced debauchery, to haunted Airbnb’s and more – while remaining centered on relational comedy. 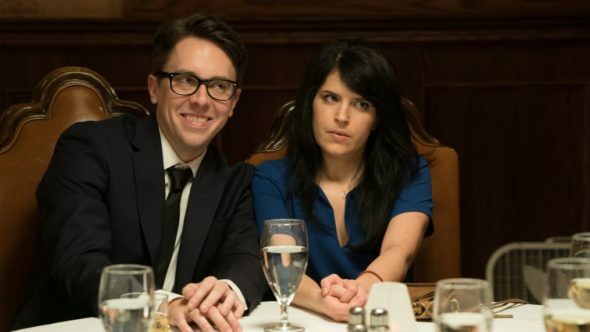 “Emily” and “Murph” are also planning a wedding and must attempt to navigate the various stresses that come with taking their relationship to the next level. What do you think? Have you seen Hot Date? Will you tune in for season two? More about: Hot Date, Hot Date: canceled or renewed?, Pop TV shows: canceled or renewed? I absolutely love this show! Brian and Emily are incredibly talented and I can’t wait till next season!! !